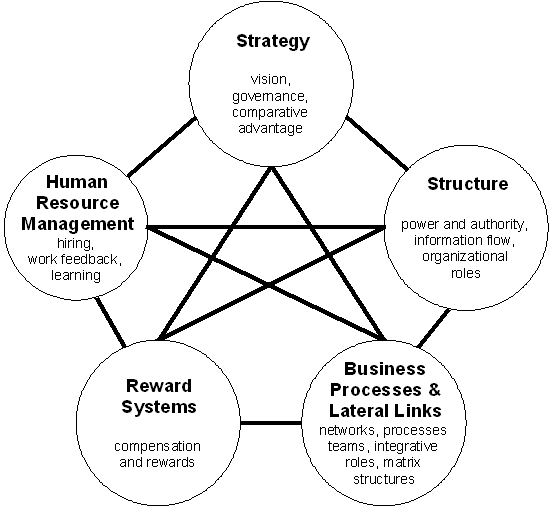 Then compare that to the core Five Element model that I use to describe organisational dynamics and a swathe of other enterprise-architecture themes. At first glance, the only real difference between the two models is that the positions of ‘Purpose’ and ‘People’ are swapped over: otherwise the rest seems so close in concept that it could be all but identical. Plagiarism on my part, perhaps? In reality, it’s not as bad as it seems. I’ve been using the core Five Elements concepts – adapted from a merge of Tuckman’s Group Dynamics and the traditional Chinese Five Elements or wu xing – since well before 1978, when I included a chapter on classic Five Element theory and practice in my second book, Needles of Stone. And although Galbraith’s diagram shows various linkages between the nodes of his model, it doesn’t seem to indicate any actual dynamics or preferred flow – which the Five Elements model definitely does, in keeping with both Tuckman and wu xing. Not so much ‘prior art’, then, as useful counterpoints to each other: both models talking about the same kind of space, but in usefully-different ways, having arrived there via somewhat-different routes. I’d have to admit that I’m not much of an academic: I prefer to work from first-principles wherever possible, and I much prefer to read people and contexts in practice than to read book after book of formal theory. I also tend to pick up ideas and images in a rather eclectic way, without really noting the detail of where they come from. There are real advantages to that approach, because it allows and enables fresh ‘mash-ups’ that really are useful in addressing real practical issues in everyday enterprise-architecture and the like. But there are disadvantages too, one of them being the risk of confusion from adaptation of what turns out to be other people’s work, sometimes resolved well (an especial thank-you here to Nigel Green with regard to my ‘repurposing‘ of some of the concepts from his VPEC-T frame), and, unfortunately, sometimes not so well. Oh well. 🙁 There’s also the real risk of accusations of ‘plagiarism’ or the like from curmudgeonly academics – and I can see their point, because my lack of awareness of ‘prior art’ can sometimes be interpreted that way, even though that’s never the intention, and I do try to give credit to others’ work wherever I know about it. In some ways it’s more a fault of possession-economics again – the delusion, in this case, that anyone can ‘possess’ ideas or facts or truth. But it’s something we do have to live with, in this insane ‘possessionist’ culture of ours, and I know I don’t always deal with it as well as some others might like. Oh well: my apologies, if so. I do the best that I can, is all I can say: and I hope it’s useful, anyway. At least in this specific case it seems easy enough to show that there’s no direct clash with ‘prior art’: much more that it’s a useful collision of similar ideas. But ‘prior art’ can be a real problem for all of us: perhaps one of which we all need to be more wary, and aware? Perfect illustration of how possession obsession is not good for people, individually or collectively. If your thought on seeing that Wikipedia page had been not “oops” but “wow” we would all be happier, wouldn’t we? I have actively tried to increase my “wow” response on finding such similarities but find the “oops” response creeps in unbidden. Can they coexist? It may be the best we can do, at least until the replicators come on-line. Maybe its just multiple great minds coming to the same conclusion? Magnum Opus: cyclic transformation of Qi / Chi? Many thanks for this, Anthony – very interesting thesis. One minor correction: although I first referenced Five Elements in ‘Needles of Stone’ (ch.4, ‘Sinuous and Straight’) way back in 1978, the Five Elements diagram that you’ve included in your thesis comes from much later. That merging of Tuckman’s ‘Group Dynamics’ and the classic Chinese ‘wu xing’ comes from work I did at various times during the 1980s and 1990s, that I then first published in a white-paper and workshop-instructions somewhen around 2003-4, as part of the work I did for the Soul Dynamics business-consultancy. It finally came out in book-form in my 2008 books ‘Real Enterprise-Architecture’ (underlying structure for the overall book) and ‘SEMPER and SCORE’ (ch.3, ‘Five Elements’): the diagram you have comes from my website, probably from around 2009-10. In short, although the documented work goes as far back as 1978 and earlier, the citable published form is only as recent as 2008. Dunno if that’s significant, but it probably needs to be said?